to guide the development of end-to-end tsunami early warning systems (TEWS) in those areas. 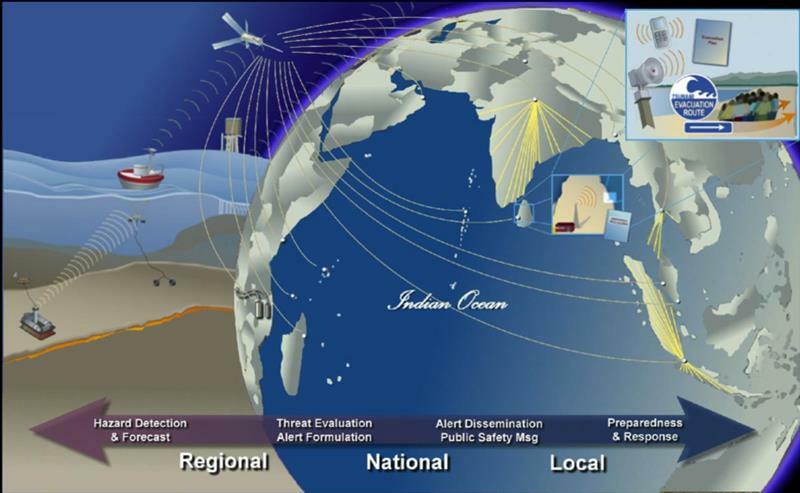 An “end-to-end warning system” emphasizes warning systems which comprise four key elements – hazard detection and monitoring, hazard assessment and mappings, communication or dissemination of alerts and warnings as well as preparedness, readiness and response. The objective of any TEWS is to generate and disseminate timely and meaningful warning information to enable individuals, communities and organizations threatened by a tsunami to prepare and to act appropriately and in sufficient time to reduce the possibility of harm or loss. UNESCO/IOC has led Member States in the four (4) regions across the globe to develop their own regional and to some extent, national TEWS including long term mitigation measures and a programme to educate and prepare endangered communities for future events. Critical to the development of the TEWS Tsunami Warning Centres and Tsunami Information Centres.